Have you been keeping up with the Jimmy Beans Wool Red A-Line Hoodie KAL? They’ve updated their progress with a few useful video tutorials. Go check them out! First off, if you are still on the fence about the KAL, it’s not too late to join us! Feel free to start anytime. To catch up those of you who are hearing about this KAL for the first time. It started August 6th and is going officially until September 17th although I imagine people will be finishing up for a while afterwards. 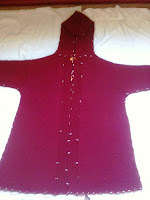 We’re working on The A-line Hoodie pattern by Diane Soucy and it can be found on page 22 of Knit Red by Laura Zander. The pattern calls for Debbie Macomber’s Blossom Street Collection, Cashmere Fleur de Lys in color #416. But you may use any yarn you like that you can get gauge with and it doesn’t have to be red! Knit Red Book Knit-A-Long REVIEW: Knit Red New Upcoming Book: Knit Red!